Been on a soup kick lately with the cooling temps and thought it would be nice to share a seafood style of soup on this cold Friday in November. Here is my version of a southern favorite, crab and corn soup, and this one is a hearty soup and would make a meal on it’s own with a side of fresh baked bread or maybe a salad. NOTES: 1.) The first part of this recipe is making a stock, and while the procedures are fairly consistent with the restaurant version, you can still make this one at home; the quantities have been reduced for most home kitchens. The total time to prepare the stock portion of the procedures is about 2 ½ hours, so a warning to you as this is not a quick recipe. 2.) In the stock portion of the ingredients you will notice that the items are “chunked”, this means a very large course chopping, in fact the onion only needs to be cut into eights and the carrot into 1 inch or large pieces, you get the idea right? 3.) You will need to shuck and clean the four ears of corn before making the stock and soup. 4.) Gumbo crabs are small blue crabs that have been cleaned and dressed but uncooked, and add an incredible flavor to seafood soups and gumbos. Gumbo crabs are skinnier, less desirable crabs that wouldn’t get used for their meat. They are sold with the back shell already removed to allow the stock or gumbo liquid access to the meat and fat within, resulting in delicious flavor. 5.) To get the eight cups of trinity (onions, celery, bell peppers) chopped you will need about 2 2/3 cups each of onions, celery, and bell peppers chopped. 6.) For the ¾ pound of blond roux you will need about ½ pound of melted butter and ½ pound of flour, see making a roux for steps needed. 1. Stock: Bring all the ingredients to a boil except the crabs or shrimp shells, and then reduce heat to a simmer for two hours. Then add the gumbo crabs or shrimp shells and simmer for another 30 minutes. Strain the stock and reserve liquid allowing it to cool. Discard the solid ingredients. 2. In a large stock pot melt the butter and then sweat the trinity and corn until soft. Add the stock and bring to boil, and then reduce heat to a simmer for 20 minutes. Skim any scum from the top of the liquid. Whisk in the blond roux and continue to simmer 30 minutes or until thick. 3. Add the heavy cream and bring back to a simmer, allow to simmer another 10 minutes to heat through. 4. Fold in the lump crab meat, and then add the Worcestershire sauce, Crystal hot sauce, and the salt and white pepper to taste. To Serve: Ladle an 8 ounce portion in each bowl and garnish with fresh chopped parsley. What’s not to like? If you don’t like this soup you have to be CRABBY! love it wonderful looking and I am a huge CRAB fan …you did it again! Oh yes, I can imagine eating bowl after bowl of this. Crab is my favorite shellfish and pairing it with corn in a creamy soup sounds perfect. Gumbo Crabs!?! Well, you learn something everyday! This looks and sounds delicious! Thanks, Chef! That does sound like a lot of work, but OMG it must taste amazing! I’m putting this on my husbands “to do” list! Gumbo crabs are something I have used since the early 1980’s when I was an apprentice at the Hyatt Regency Hotel in New Orleans. We would use about 20 pounds of the little gems in every batch of gumbo. Oh you are talking my kind of language! I think the home run derby has begun! You are so right, and while the stock is simmering all the other prep work can be done in the meantime. It is a lot of work, but worth every drop of sweat! 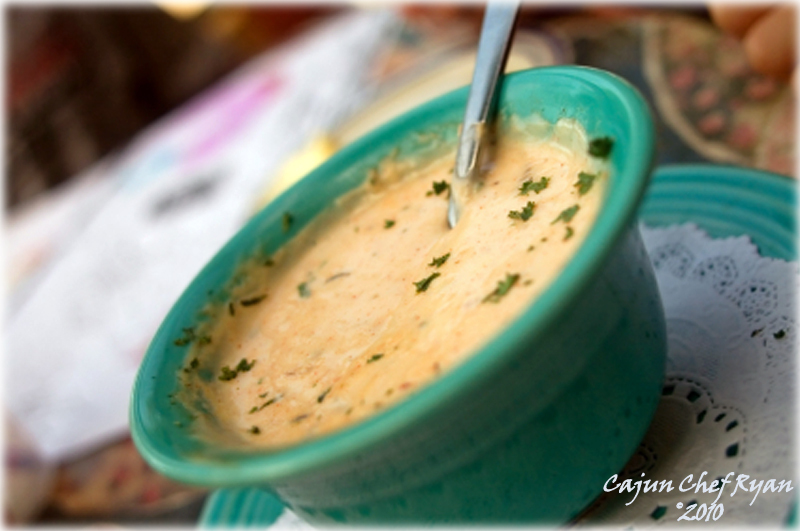 I am surprised you have never used the gumbo crabs. But, they are hard to find outside of Louisiana. Available for overnight shipment outside of the Bayou State. I have been enjoying your blog and exquisite recipes. I represent Cajun Country Rice brand and would like to send you a sample of our rice along with a Falcon family recipe for your holiday table. Would you email me your mailing address so that I may do so? Looks lovely! Thanks for the tip. I really enjoyed this post. I love Creole seasonings, this sounds like a great recipe :)! Thanks for sharing! yum, this sounds fantastic! definitely a delicious way to stay warm. With it as cold as it is right now, this sounds fantastic. What a great combination of spices and ingredients. Thanks so much for passing along this recipe. It’s a keeper for me. Now this is super dooper Cajun cooking Chef. Love it, I’ve never made anything like it and I’m dying to try it too. We have soup dinners at my house about 2-3 times per week, and the exquisite combination of flavors you’ve used here make this soup a must-try for me. One (possibly dumb) question, though: is it worthwhile to make less than 24 cups of this soup? That’s a lot! And if not, does it freeze well? Of course you can always cut the ingredient amounts to halve the yield. Considering that you have soup dinners 2-3 times a week, I would be willing to bet that the full yield would be a great leftover for several days, as it can be eaten with 3-4 days of preparation when held in the refrigerator. In fact this soup gains flavor one to two days after it is made! This soup does not freeze as well as some other soups, since crab meat does not hold up quite the same once frozen then thawed. Having said that, the crab meat within the soup is going to be protected somewhat by the other ingredients, specifically the liquid portion of the soup, and it would not suffer as much “freezer” damage as if subjected to the extreme conditions on its own. Moreover, if you do decide to put it in containers for long term “freezer” storage, I would recommend using it within a month or so.